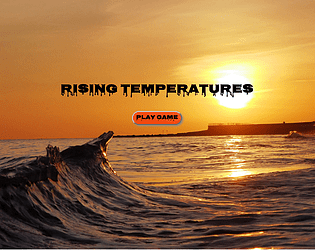 A web game where you play as a politician against global warming. Created for the 2017 Open Jam in 48 hours. Thanks for the link, I was able to play it just fine! I don't know if you ever played Fable 2, but this kind of reminded me of when you become king in that game. You can do everything to make the people happy but then you have no money left in the treasury. I like that you made a game to make people think. My apologies for the game being unplayable for so many. I like it! Have you heard of Twine? It's primarily used for interactive fiction (text-based) but with certain formats you can include sound (not Harlowe format). Thank you for the interest; unfortunately the upload failed and I can't seem to find a way to update it. As a workaround I have deployed a server with the game on it which I will keep up until shortly after the game jam. Was able to play it thanks to mwcz. I liked the setting, but would've liked to make more decisions AND have more data to base those decisions on. Perhaps it could've been even made into something of a resource management game, where you have to balance different things out, like "do you take the taxi or the bus, the bus is X% more environmentally friendly, but there is a Y% change you'll miss meetings you attend" etc. I liked the aspect of having to balance my decisions based on the support of the people and their results too; perhaps it's okay to vote against something that would be good for the world, if that means I can keep trying to make the world a better place thanks to the public support for that much longer? I really dug the music and the theme. I would have greatly enjoyed a longer "storyline" but I understand the time constraints all too well! Nice job! the game is currently unavailable." I added a comment with instructions for how to play it in the meantime until the invalid file is fixed.